For many individuals over the age of 65 and coming to the United States health insurance can be daunting. To start with most over 65 are covered on Medicare. Since individuals do not haven enough credit to qualify for Medicare this is not an option. What does an individual do over age 65 but not on Medicare? Seek an expat insurance policy that will cover them here in the United States. Go to Healthcare.Gov and buy an overpriced/crappy network plan. As you can see only options 1 & 2 would be ideal. We work with every carrier on an off the exchange and all expat insurance policies so we can custom tailor a soluton to your insurance needs. Please give me a call at 800-974-5077. E-2 and EB-5 are two of the more popular options for individuals looking to invest and or start a business in the United States. Before we get into the differences in healthcare options lets explain a bit the differences. The EB-5 visa gives foreign entrepreneurs and investors the opportunity to secure a green card for themselves and their immediate families for investments that stimulate the American economy; based on significant capital (500,000) in a new commercial area with the investment at least guaranteeing 10 full time jobs. The E-2 Visa does not provide for a green card. It is less expensive than an EB-5(100,000) investment o and the application process is much faster. Besides the upfront costs many individuals prefer this visa as they do not want to become U.S. Citizens due to a myriad of reasons including taxes. Now that we’ve explained the differences in the visa types lets go over the differences for health insurance. For an EB-5 individual they have access to all ACA (Affordable Care Act) plans on and off the federal exchange. Coverage is permanent and not based on their medical history. With all the changes in healthcare options are not as vast as in the past. In most cases ACA plans will only cover you in your state and leaving that state will find you out of network. For an E-2 individual finding permanent coverage may be a bit more difficult. At E&M we believe that permanent insurance should be sought in most cases. Since ACA plans may not available we have solutions that provide high quality insurance coverage anywhere in the United States. Individuals who are applying for EB-5/E-2 visas are used to high quality care. Whiter they are investing 100,000 or 1,000,000 it doesn’t matter to us. We just want to make sure we are providing them the strongest medical care possible that covers them when in need. To not offer this is putting your biggest investment(you) at risk. For a quote on an E-2 or EB-5 health insurance policy please call Evan Tunis at 800-974-5077. A few years ago, it was rare to have dual citizenship. Now it has become more popular to own one, two or even three passports. For example, let use the country Malta. Malta which is one of the most popular passports to get. The reason for this is private equity or hedge funds can benefit from a friendly tax regime. In addition, a passport in Malta also gives the individual eligibility to work anywhere in the European union. For health insurance, the benefits could be vast. For example, an individual who Is a U.S. Citizen who spends quite a bit of time in Germany can pay less than 50% then his counterpart in the United States. Are the benefits different? No. The reason for this is the price of healthcare. If you are in a country where healthcare is cheaper like Germany or Canada your premiums will also be cheaper. In conclusion, it may make sense for an individual to get dual citizenship depending on circumstances. At E&M we only specialize in life and health insurance for these individuals. For a quote on an international health policy please call Evan Tunis at 800-974-5077. When shopping for health/ life insurance for an individual moving to the United States it is important to consider whether the plan is permanent or temporary. But Evan, I thought all plans were permanent? Not quite…. When an individual is not a resident they can have their choice between a temporary and permanent policy. Why might an individual want a temporary policy? For a myriad of reasons including only being in the United States for a short period of time, waiting on resident status to jump on a group plan or just not being aware that policy has an expiration date. Another reason is price. Generally, a policy less than one year in duration will be less expensive than a permanent policy. This makes sense when you consider a carrier just has to accept the risk for a short duration of time and the longer you are on a policy the higher the risk to the carrier that some illness or injury will occur. Under a permanent policy the carrier auto renews you at the end of your contract year. The carrier CAN NOT cancel you for injuries and claims (unlike car insurance). A K-1 is a nonimmigrant visa that permits an expat of a U.S. Citizen to travel to the United States for marriage. The marriage must be done within 90 days of their admission to the country. For individuals looking for health insurance for their expected spouse this could create a significant issue and could threaten their Visa status. I’ll explain further below. As a newly arrived individual in the U.S. finding quality health insurance could be difficult. Most of quality carriers (Non-Obamacare) will require the person to be a resident of the U.S. for 6 months. Many carriers also ask that the person to be a lawful U.S. Citizen or permanent resident. At E&M Global Insurance we seek permanent solutions to this issue. We believe an individual should have high quality PPO coverage from day one. In addition, after speaking with many immigration attorneys having a health insurance plan already in place may help your chance by getting your visa more easily approved. The government is wary of individuals coming in and being a drain on the health care system. By having insurance, it shows them that no you are pro-active and this won’t be an issue. To learn more about insurance for a Fiancé please give Evan Tunis a call at 800-974-5077. 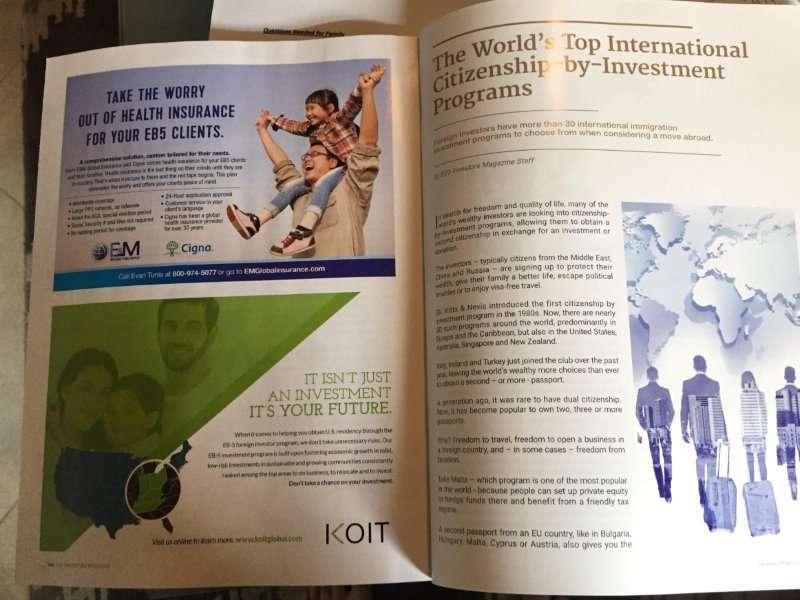 E&M Global Insurance is happy to announce that we will be featured the upcoming EB-5 Investors Magazine in August. 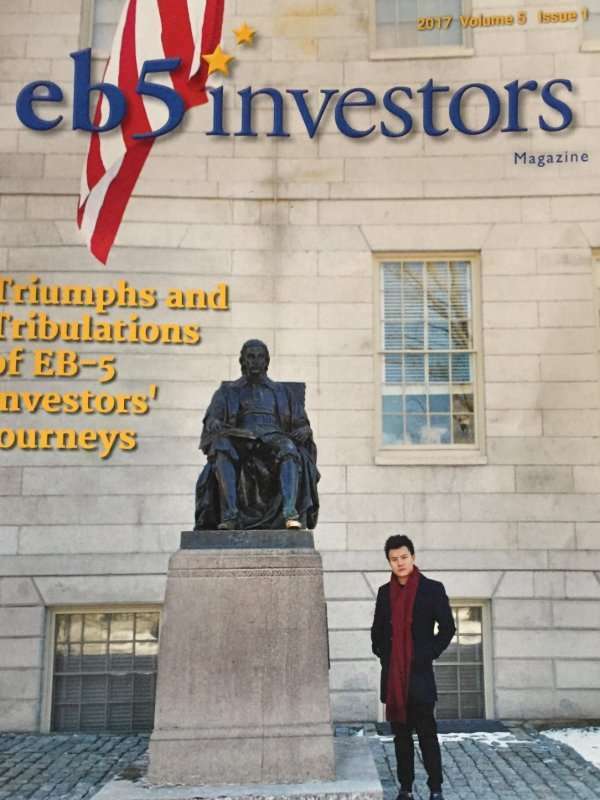 The magazine which is published for EB-5 investors, attorneys etc. will allow E&M to be seen by a new large international market. E&M Global is a full-service insurance agency providing health, life, auto and homeowners insurance throughout the United States. Our specialty is providing health & lie insurance for those born outside the United States and U.S. Citizens who travel internationally. During the American Immigration Lawyers Association Annual Convention, we were lucky enough to get insight and perspective from many of the top immigration attorneys in the world. Among their many questions and concerns was do we offer health insurance benefits for J-1 students? Before we define what, these plans look like let’s take a second to define what an J-1 Visa does. A J-1 Visa is a non-immigrant visa to scholars, professors or students that allow them to obtain medical or business training within the U.S. The type of Visa is common among universities and other education facilities. 2. Maximum deductible of $500 per accident or illness. One of the advantages with working with E&M Global for a health policy is that we can custom tailor a plan to exceed the minimum requirements that will not be costly for your clients. Such things like doctor visits, maternity, medications and wellness checkups can be added to them polices. In addition since we only work with large carriers such as Cigna Global and International Medical Group there is no concern about a carrier not paying a claim. If you would like to know more about a J-1 health insurance policy or have any questions regarding international health insurance for your clients please give us a call at 800-974-5077. This morning we received a call from a law firm asking us if we look into insurance options for a nanny on a B-1 Visa. Visitior visas are nonimmigrant visa for person who want to enter the United States for a short period of time for either business or tourism. The short answer is yes we can absolutely cover this client. A plan like that covers at a maximum of $50,000. At E&M Global Insurance we believe that if someone is watching your children they need to feel secure that if they are sick or injured they will have the best care available. Taking care of your children is enough of a job worrying about your inadequate insurance should be one of them. For a quote on a Au Pair or Nanny Health Insurance product please call Evan Tunis at 800-974-5077. Many of our clients seeking EB-5, F-1 or other visa types are doing it mainly for the ability to allow their children to attend a U.S. college or high school. There is a myriad of reason for this however we will discuss what you need to look for in an international student health plan. want or will I have to go to an inferior hospital first. 2. Will my plan that I am buying cover me in my home country as well? International students face daunting challenges from a foreign language, new country, school etc. Having proper insurance shouldn’t be one of them. What is a “network” for an Expat Health Insurance Policy? When shopping for Expat Health Insurance is of upmost important to make sure your new plan has a large network. What does a large network mean and how will this affect your plan will explain in detail below. To begin with a network is a group of doctors/hospitals who take your insurance plan. It is important to understand that even the best policies/carriers may not take your insurance. Some networks require a general practitioner who oversees your health and to see a specialist you would need a referral. For an Expat is it vital to make sure whatever plan you select covers the hospital/doctors your wish to go to. If you do not ha have any doctors yet make sure all the better hospitals in your area are covered on thenew policy you are considering. To select a policy without having all hospitals covered is exposing yourself to great liability. Once you have established a carrier has a sufficient network you can then begin to look at plan options and deductibles. In conclusion before shopping for any new policy make sure the network is superior.